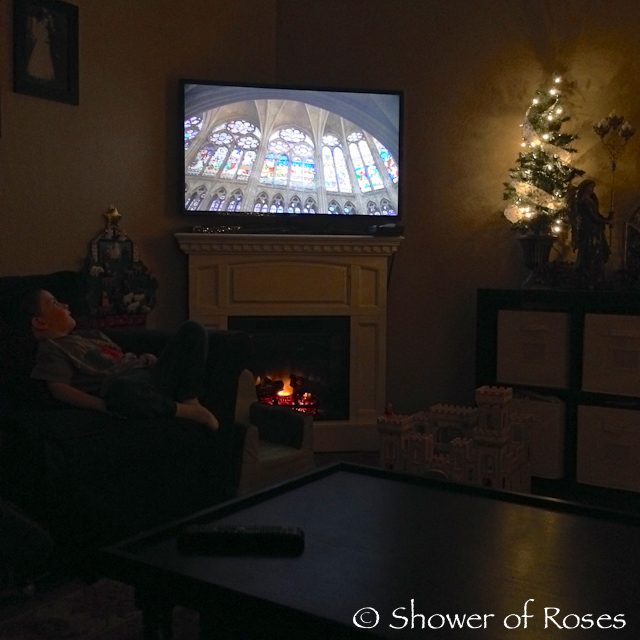 On December 29th, the feast of St. Thomas Becket, our dinner conversation about the saint and our Cathedral Window Cookies for dessert led to a family movie night following dinner thanks to a recent recommendation I had received from Julie and KC in the comment box! Building the Great Cathedrals by Nova is available on DVD, or you can watch it for free at PBS, You Tube (embed below), or on Amazon Prime (which is how we watched the program). It was excellent! 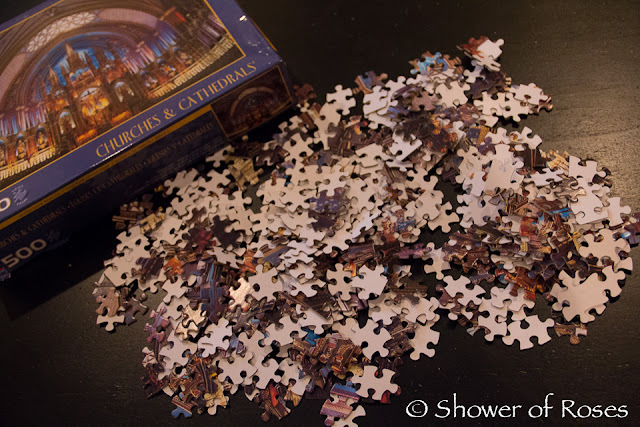 Of course, afterwards I had to pull out a 500 piece "Churches & Cathedrals" puzzle which I purchased a while back at an outlet store for just a few dollars. It only took us the rest of the evening to put it together! Since then the older boys have been discussing ways to build a Cathedral out of their legos (and wishing they had a few more Council of Elrond sets for the arches!) and Snuggles asked us to read his copy of A Knight’s City: With Amazing Pop-Ups and an Interactive Tour of Life in a Medieval City. I need to remember to re-watch this video the next time we are studying the Middle Ages! wow. Thank you for sharing! This is going to be great to share with the kids. Love how you always have something to reinforce respect for His beloved church. Your many ways of teaching the faith are awesome. God bless and reward you. Wow, I didn't know that was available on Amazon Prime. Have put it on my watch list. We love going to old churches for Mass and this will fit in nicely with what we have seen. Thank you for sharing! We have a few 3-D Puzzles, including St. Peter's, but we haven't put any of them together yet! We will have to get started on that one soon and then maybe try one of the cathedrals! 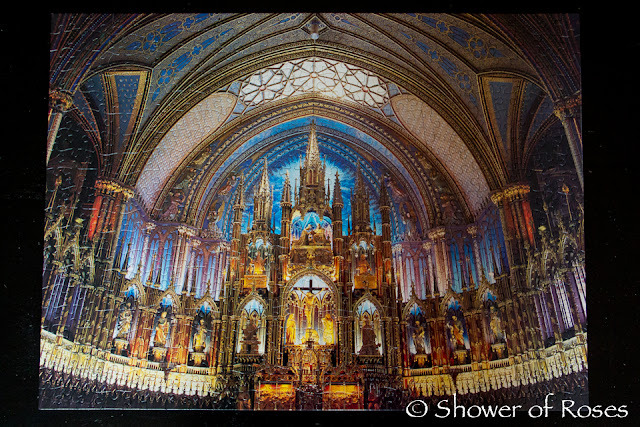 How neat that they have one for The Basilica of the Immaculate Conception! 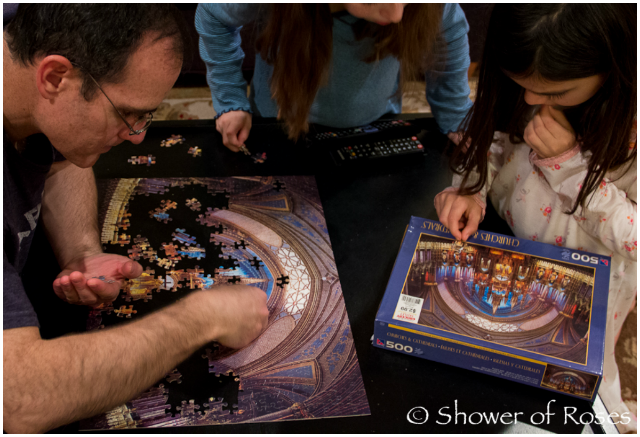 We put St. Peter's together last Easter and I've also got Notre Dame Cathedral for this year at some point for history once we reach this period - I will have to bookmark this page to remember to watch this video as well!! Looks wonderful! I've been to several cathedrals in Europe in my younger years and they truly ARE breathtaking! We watched the NOVA Cathedrals and enjoyed it so much! I think we really want to see it again. After that we did a comparison of David Macauley's Cathedral. We have his book, but we have never seen the DVD. I'll have to see if our library has a copy! I also noticed that the book has been revised and reprinted in full color! I've been considering purchasing it for one of our boys. Have you seen it?